NEW WEB CONTENT LAYOUTS: When you click on a Web Content link in the left-hand nav (ex. Careers, Hot Deals, Blog, etc. ), you'll see that we have a new defaulted card layout - see a screenshot of this new card-view layout. The list view option of web content has been updated as well - see a screenshot of this new list-view layout. When you click on a web content title to see the details, that layout has had a refresh too - see a screenshot of this new detailed-view layout. ADDED A PAY BUTTON: We've made it even easier for an Info Hub user to pay any open balances they may have. If a user has an open balance, they will now see an "Account Balance" box on the right hand side of their homepage - see screenshot. Clicking the pay button located in that box will bring you to My Info> Billing tab (formerly known as Account Tab). EVENT REGISTRATION: After a user registers for an event through the Info Hub, they will now have the ability to register more users, if needed. For a registered user, the event details page will still say "registered." However, they will have the ability to add additional registrants by clicking the "Register More" button. UPDATE FOR OTHERS CHECKBOX: We no longer display the "update for others..." checkbox that is available in the Info Hub where users update their email address, phone number, address, and website. This check box stirred up some confusion for our customers, so this is no longer available. This was a uservoice item! EVENT REGISTRATION PAGE: We’ve improved the look of the event registration pages, helping to give our customers a more professional look. The colored bar at the top of the event registration page is the color that the association has marked as their Primary Color (located under Setup> Info Hub Settings> Primary/Secondary color selection). The button colors are then set by the secondary color that tenant has chosen. These changes were cosmetic only, and functionality remains the same. Existing events and future events all have this new look. SEE MORE BUTTON: With the event registration page improvements, longer event descriptions were causing users to have to scroll quite a bit to get to the actual registration area. We have now added a "see more" button to easily allow users to expand the description area of the event. See a screenshot. That way, if the user has already seen that description information on the Event Details Page, or if they don't need the description, they are simply able to skip over it. EVENT SUBMIT BUTTON: Previously, the event submit button would not become active until everything on the event registration form was filled out correctly. This was potentially confusing for end users, because you didn't always understand why it wasn't an active submit button. Now, if you miss a required field or miss something else that needs to be entered, you will be able to click submit, and a popup window will appear helping to explain what it is you still need to fill out properly. STAFF ONLY REGISTRATION TYPES: We have now added the option for Staff Only registration types. Now, when setting up a registration type, you have the option to have it be used by Staff Only. Meaning, when a staff member goes in through the backoffice, registration types with this enabled will be visible to them. That particular registration type will not be visible to anyone else. A use case for this may be you want to register special guests, yet still be able to include them in the attendee count and in reports. To use this new setting, go to your event> Attendee Setup tab> add a registration type> enable "Allow Staff Only" checkbox (see a screenshot). This was a highly requested UserVoice item! Keep those votes coming. EVENT VENUE REMOVED: We have simplified how we handle location details in event setup, by removing Event "Venue" and replaced it with Location Name and Address. A great part about this improvement is that location name will be a type ahead field, and it will search addresses from past events as well as addresses from the organization in your database. This will eliminate the frustrations that Venue may have caused (not able to edit or change, etc. ), yet still make it easy to reuse an address. See a quick video on what has changed. NOTE: We have written and deployed a script that updated all existing customer venues into locations. There should be no interruptions for current customers. MOBILE BUTTONS: When using a mobile device to register for an event, you are now able to purchase additional items with an easier to read quantity box. Previously, the spacing was making it very hard to see what quantity you have selected. INFO HUB DESCRIPTIONS: In the Info Hub, you are now able to click on any links that were placed in the event description. Previously they were not listed as links, and just as plain text. EVENT ATTENDEE REPORT: We've added in additional fields to display in the Event Attendee Report, such as: Discount Name, Discount/Promo Amount, Individual Discount Amount, and Individual Purchase Amount (as well as, Registration ID a few weeks earlier). These fields will greatly help staff members dig into the event data they are looking for. The fee columns are also much more accurate now. The fees are no longer duplicating in a table/group purchase or with multiple registrants in the same registration. ContactID has been added to the Event Sponsors by Contact Report and the Contact List/Committee report. EDITING CHECK NUMBERS: If you happen to enter the wrong check number for a payment, you are now able to open up the payment reference screen and change the check number if need be. You can access this screen from both the Contacts-Billing tab and from the Billing - Payments tab. EVENT BILLING: For fees that are set to “Recognized Fully on Event Start Date,” and a registration occurs after the event end date, the recognition will be on the date of the invoice and not on the event start date. This will help keep it from modifying GL accounts in the past. For example, this is how it will now work going forward: Example event start date is 5/19. If a registration occurs on 5/28 (or any date after 5/19), then the recognition would be on the date of the invoice (5/28 in this case) and not the event start date. INVOICE DATES: You are now able to change the invoice date of an existing invoice, and see that both the SourceTxnDate and the Recognition Date are correctly updated in the Accounting Transaction Report (as well as other accounting reports). This fix should relieve issues that were presented when backlogging invoices after data conversion was completed. See a quick video on this. FORM NAVIGATION LOGIC: You can now easily set up more complex forms using navigation logic. Yes/No questions, Drop Down questions, and Drop Down with Fill in questions, now have the added functionality of being able to choose which page of the survey they are brought based on the answer they select. For example, if you had the question of "Are you interested in becoming a volunteer at an upcoming event?" and they answer "No," they could then just be done with the survey. If they selected "Yes," they could be brought to a new page with additional questions/information. This navigation logic will only work with form pages, and not form sections. You will see this new logic when you add one of the question types mentioned above (make sure advanced is checked - see a screenshot). SHARE FORM/SURVEY LINK: You will now be able to easily share the link to the survey by using the new icon in the right-hand side of the forms screen (see where this is). Clicking this icon will actually open an email with the Form URL in it. But, that’s not all. Using this share button, also adds logic in the form URL, such that it will prefill the form page with the respondent's: Name, Org, Address, Email, and Phone (if in your form, and in your database). This will save users time and increases the survey completion rate. UPLOADED FILES: Files that are uploaded in response to an upload file custom field in a survey, will now also be stored in the contact's profile, under the Files tab. Previously, the only place you could see the files that were uploaded was finding that survey's folder in the cloud module. The file is still being stored there as well. For more information on how to use the Forms/Surveys module, visit our wiki. If you don’t currently have the Forms/Survey module in your subscription, contact the support team at gzsupport@growthzone.com. FUNDRAISING: You will now see that there is an area to customize the fundraising thank you page that end users see when making a donation/pledge. See where this is. This rich text editor is available to customize on each fundraising campaign. We've even included a short default text to get you started. However, users can change that to whatever they choose. LIST/COMMITTEES: When viewing a list/committee in the back office, there is now a "Do Not Contact" column that will display at a glance if the person has unsubscribed. See where this is. Yes=They are marked as Do Not Contact for that list. No= they are not marked with Do Not Contact. Meaning, those marked with "No" should receive email messages sent to that list. CUSTOM FIELDS: As you may have noticed, next to the titles of custom fields throughout the software, there is a now an open eyeball or a closed eyeball, which is a nice visual way to see if those fields are public or not. This is only a back office feature. You will also see those eye icons when viewing the results of your forms/survey. NEW ADDITION TO TABLES: Currently on both the Events Attendee Tabs AND on an Individual Tab of an Organization you will see a new list icon above the table. Here is a screenshot of where this is. When clicking this icon, you are able to deselect specific columns of that table, which then hides them from your view. Eventually, we plan to build the ability to customize which columns you view in different screens, and this is step one in the planned approach to that. More to come! CONTACTS PROFILE: We've moved and improved the related businesses section of an organization's profile to be easier to see and understand at a glance. You will now find the "Related Businesses" section is under the membership area. We've also broken it up into two tables Child Organizations and Parent organization (if they have applicable items in both) so staff members can easily distinguish between the two. See a before and after mockup. 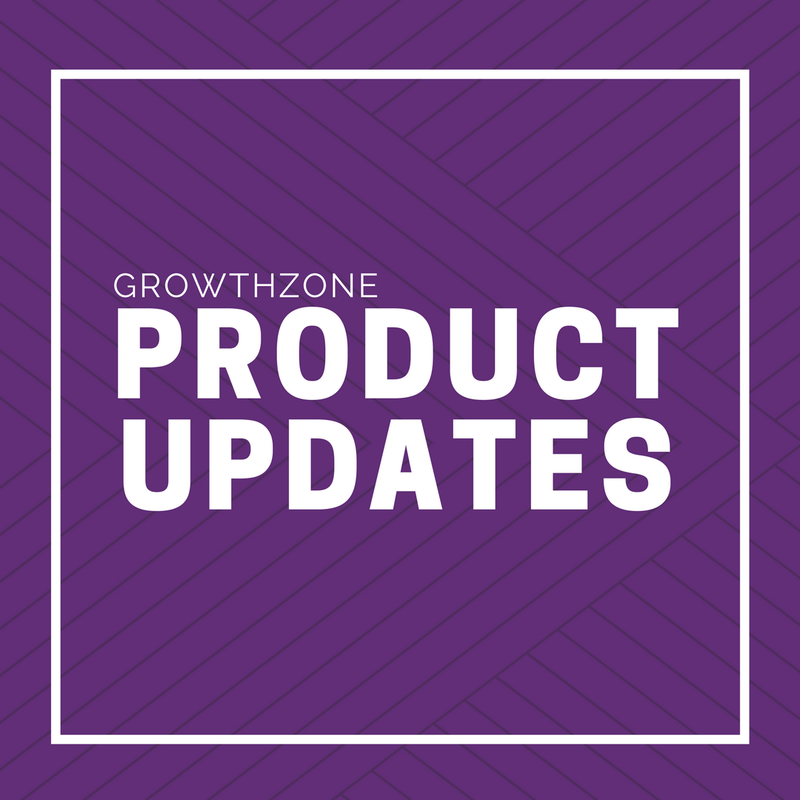 GROWTHZONE PAY: We've changed the name of the Integrated Payment Processor to GrowthZone Pay. You may see this referenced in places throughout the software. If you don’t currently utilize our integrated payment processor, visit www.growthzone.com/gz-pay for more information.